A random thought, a few hours of planning and a thumbs up from my friend- that’s all it took for me to land up in Japan. My summer internship would begin on the 9th of May and my exam would end on the 3rd of May. I had about 4-5 days for a small trip. Weather in other Asian countries was unpleasant to say the least whereas Japan could boast of a nice and comfortable weather at this point of time. 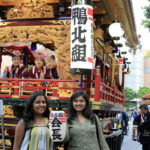 Moreover, my friend was studying in Japan and hence could help with the planning. Hence two days before my exams began, I began to plan my trip to Japan. The main obstacle which genuinely challenged my entire plan was visa. Carrying an Indian Passport implies that I would require visa for most countries and Japan was no exception. The embassy required 5 working days to process my visa which meant that I would get my visa on the day of my departure. It also meant that I would have to collect my visa on the day of my last exam and then fly out immediately after my exam. It was a risk, a big one but if it worked then I would be able to spend maximum time in Japan. I spent the entire day gathering documents and booking my flight tickets. At a point of time, I was almost sure that this trip is not possible because a certain document I required from the university for my visa application could be delivered to me only after 4 days which meant I would not receive my visa even on the date of departure. However, a lot of running around and talking to different people yielded good results and I managed to receive the document. The next day instead of preparing for my exam, I rushed to the Japan embassy and applied for my visa. Many people called me crazy and many called me lucky. It’s always easier said than done. You can sit there and dream of travelling the world or you can get up and overcome every obstacle and get on a flight. The choice, most often is yours. I had decided that I don’t wish to regret missing an opportunity later and since you only live once, I wanted to make sure I make the best use of this one life. Hence, on the day of my last exam, I collected my visa, packed my bag, finished my exam and rushed to the airport. My friends booked a cab for me and the driver was genuinely concerned if I can make it on time. The stars aligned to ensure that every risk I took was successful and finally I was on my way to Japan- the land which is a world apart from any other country. A long flight via Malaysia landed me in Kansai, Osaka. Right from the beginning, Japan never failed to surprise me. I found an alarming number of people, especially girls wearing masks. My friend later mentioned that not only are they extremely careful about not spreading any infection, but in some parts of Japan, it’s also a fashion trend! Well, wasn’t Japan known for its peculiar trends! Kansai airport is located in an artificial island in Osaka Bay. Needless to say that the drive back to the city mainly involved driving on a bridge over the sea. I had landed in Japan during the Golden Week- which is a week of celebration and holiday. The first thing that struck me was that the city was abnormally quite, at least compared to Singapore. 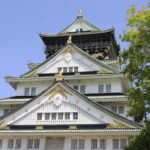 We drove to the Osaka (Jo) Castle. 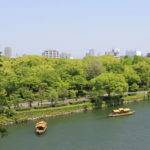 The beautiful greenery all around and a canal surrounding the area was a great break from the dazzling Singapore skyline. 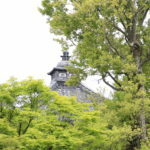 Osaka Jo was a beautiful castle standing amidst this greenery. The queue to enter the castle was never ending and thus we decided to skip it. Instead we walked around it to enjoy the scenery. Cycling is extremely common in Japan and I realised yet again that I need to learn cycling soon. Osaka is famous for its Takoyaki! Hence, I had to try the world’s best Takoyaki and it did not disappoint us. It was truly mouth-watering. Japanese food is famous throughout the world and now I know why. We went on to try Okonomiaki despite struggling with chopsticks, I enjoyed every bite of this delicious item. We spent the next few hours in another city called Nagoya and tried to figure out how the complicated train service works. There are at least 4-5 types of trains and you can’t avail all of them from all stations. This is along with the problem that most writings or instructions are written only in Japanese and everyone speaks only Japanese, especially in the smaller or less touristy places. It was night by the time we reached Hamamatsu, the city where my friend lived. 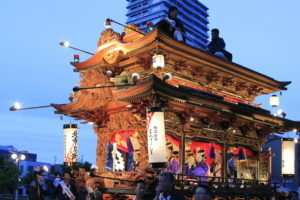 It was also the city where I would witness the festival- Matsuri. After a soulful talk with my friend, we crashed for the night. Although it was the last day of Matsuri, people flowed in with heaps of energy. The kite festival was held beside a beach. 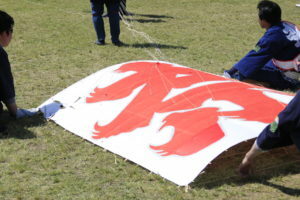 Hundreds of groups of Japanese dressed up in traditional clothing and flew huge kites in groups for the healthy growth of their child. 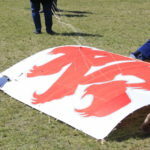 We enjoyed the wind as hundreds of people ran around to save their kites. After sometime we headed to the rock beach and played around with the waves. The sun kissed greeted us along with the strong winds making sure it’s the perfect weather for a beach day. Water has always made me happy. There is something calming about just being in water. With sand on our feet and a smile on our face, we headed back to the city where we witnessed the Parade and the celebrations. Matsuri almost felt like a global festival rather than a Japanese one. There was food from different countries and performances representing different nations. There were two girls performing on a unicycle, a group of women dancing on Hawaiian music, a guy showcasing Michael Jackson’s Moonwalk and it went on. In the evening, the whole city comes alive with the parade which consists of “floats” from each part of the city and are gorgeously decorated. Children sitting inside these play soothing music using various music instruments. The floats move around the city with hundreds of citizens following them. The whole city celebrates together and happiness flows in the air. 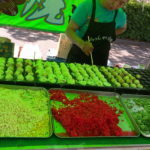 After witnessing Hamamatsu Matsuri, we headed over to the downtown area to enjoy some snacks. 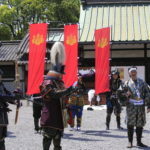 I often pictured the Japanese as a very serious bunch but that day I realized that every human being likes to have fun. Burdened by societal pressures of working hard, they barely get a second to spare for themselves or their families. This is probably why festivals most often mean family time for them. Over dinner, we tried to figure out the best way to reach Mt. Fuji the next day and after a long discussion, we decided to take the train to Fuji station and then take a bus from there. Everyone said busses will be available but even the officials in the train station could not give us the details. We thus had no choice but to go there the next day and figure out the bus route. After catching 2-3 hours of sleep, we took the train to Fuji station. Thank god my friend understands Japanese, otherwise I am convinced we would never make it. After changing trains and reaching Fuji station, we asked a lady at the counter about the bus. What happened next made me realise the importance of planning beforehand, especially when your schedule is not flexible or you have only a few days at hand. The bus which is the only mode of transportation other than cab, runs only on weekends and it was a Friday. Of course, I did not want to miss my only chance at looking at Mt. Fuji. So, we took a cab and paid an insane amount for it. The driver kept asking us if we are sure we want to go because the amount was so high! 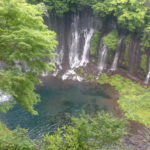 Since it was raining, we also told him to include Shiraito waterfalls in the trip which increased our amount even more. Thankfully, the Japanese are one of the most sincere, helpful and honest people in the world. Their value system knows no bounds. He offered to drive us at an agreed price and later we realized this amount was much lesser than the metered fare. 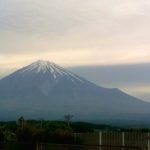 The best part of Fuji city is that throughout the journey to Mt. Fuji, we could see the mountain at our side. 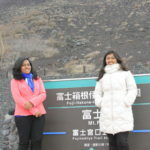 The cab dropped us somewhere in the middle of Fujisan (Mt. 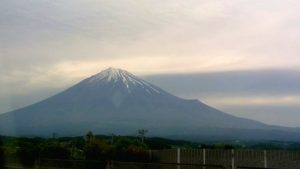 Fuji) and a gush of cold wind greeted us as we stepped out of the car. Mixed with a drizzle, the cold wind almost froze our hands for a while. We walked around for a while and took pictures. 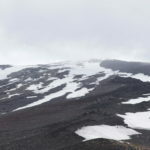 We observed as the clouds covered and uncovered the partially snow covered peak, as if playing hide and seek with us. The mighty mountain seemed different from up-close. I remembered a picture from the souvenir shop which was taken in winter, the sun rays covered the completely snow capped mountain and gave a divine glow to it. I immediately wished to come back in winter to this beautiful mountain. Half drenched in the rain, we made our way to Shiraito Waterfalls. You thought Fujisan was beautiful? Well, so are a 100 other peaks in the world! 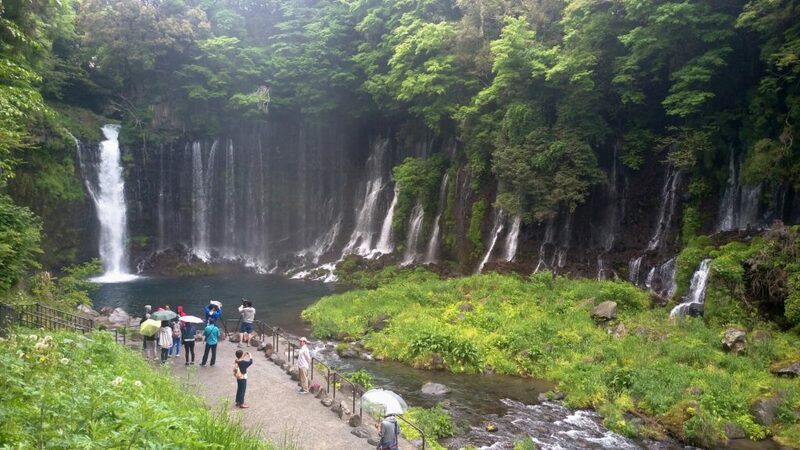 Welcome to Shiraito Waterfalls- an area covered with numerous waterfalls in a semi-circular fashion. One of its kind in the world I believe. Otodome waterfalls lives up to its name which means “Stop the sound”. 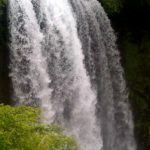 A noisy, high and speedy waterfall before you make your journey to Shiraito waterfall. The waterfalls flow beautifully with a maddening force throughout the year. 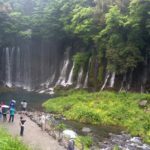 Walk for a minute to witness the unique sight of Shiraito waterfalls. This one is worth every hype, even more so than Fujisan. As you make your journey down the steps of Shiraito waterfalls, every moment you shall be mesmerized at its simplicity, at its beauty. Although the water flows calmly, the whole area makes you feel at peace. Oh how I wish, we were allowed to immerse ourselves in the waterfalls. It is a hard truth that my pictures definitely failed to capture its true beauty but it gives me great joy that my eyes have captured that sight and frozen it in my memory. The cab driver helped us take plenty of pictures and showed us around. The Japanese are really a unique race. After our day trip, we headed over to Kyoto. Of course, you can’t come to Japan and not ride the Shinkansen- Bullet train! So, we took a bullet train from Fuji city to our most awaited destination- Kyoto! This is again an experience one must not miss out on. Although, the tickets are more expensive, the journey is worth it. As one bullet train passed by us, I was taken aback momentarily at its speed! The interiors are well designed and comfortable and in almost no time we were in Kyoto! Finally we stepped into this city where I wish to live someday. A city that I shall never forget. As we stepped out of the station, we were greeted by a crowded place which had numerous bus stops and maps. After staring at a few maps, we still looked lost. This is when the Japanese proved their helpfulness yet again. An old man walked up to us and guided us to the correct bus stop. The best part about the people is, they don’t just guide you! They take you to the nearby place you need to go to. We took a bus and in Kyoto, the ticket system was different. It’s a strange system where you pay the same amount to reach a destination, no matter where you boarded the bus from! The ticket prices are almost same if you travel two stops or ten stops! We alighted at our stop and walked around in the dark to find our hotel. A lady helped us and finally we entered our room. We could not contain our excitement although our body told us to sleep, we ventured out to the streets at night searching for dinner. 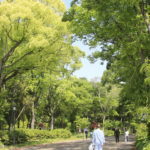 Japan is one of the safest countries in the world and that naturally affects our behaviour. In many countries, two girls would not dare to venture out at night but this city reminded me of Singapore, where you can go out even at 2am and not feel a hint of danger. The streets were quite but a few small eateries were open. 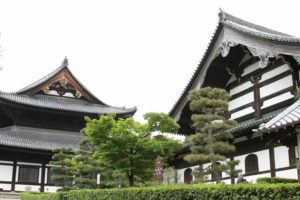 The houses had a traditional feel to it. We walked around aimlessly and finally found a tiny place which was cosy and looked just perfect. It was a small open kitchen eatery and the host was friendly. He made steak in front of us and it was one of the most delicious steaks I have ever had! I somehow managed to compliment him in Japanese and his face lit up with happiness. My friend spoke to him for some time and we enjoyed our dinner and hung out there till our bodies missed the beds desperately. These small eateries are one of my favourite, they are small, cosy and in every corner of Kyoto. We ended the day after making a rough schedule for the next day. We ventured out early morning. Never forget that locals always know the best. We asked the guy who runs the guesthouse how to get to some of the places. 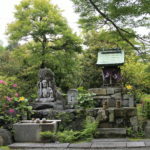 The problem is that Kyoto is a city filled with absolutely beautiful shrines & temples. 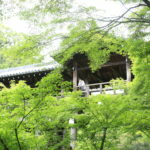 You would be in serious dilemma about which ones to visit, especially if you have made the mistake of visiting Kyoto for one day. There are plenty of itineraries available on the internet but we did not follow any. Instead, we chose a few random places and I have no regrets. 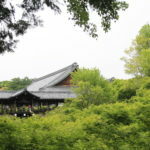 Many blogs told me that Tofukuji temple is a must see which many people miss out on. 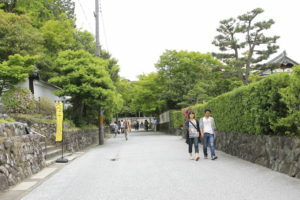 Thus, right at the beginning of our journey, we took a bus to reach Tofukuji temple. On our way, we entered at least 5-6 other small temples each of which are beautiful and peaceful. 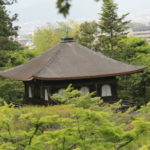 The best part of Kyoto is not the huge temples with lush greenery. It’s the mood of the city which is set by its beautiful curvy lanes and the innumerable small temples which stand like deserted but well maintained houses welcoming you with their gates wide open. Even if you don’t wish to buy tickets to enter the famous temples, you can always find a spot in these shrines & temples and enjoy the mood of the city. Some Zen art,some typical Japanese doors and gardens after, we finally reached Tofukuji and it was worth every minute of our time. 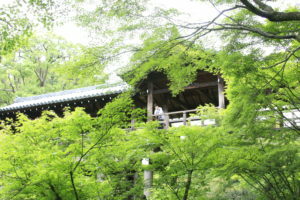 An entire area filled with temples resonating Zen art and lush greenery at every angle your gaze can travel. A small canal peeks out of this beautiful scenery and the flutter of the leaves instantly makes me regret not visiting Kyoto during autumn. Autumn is when the leaves display different shades of red and orange almost as if painted by artists. I could not even begin to imagine how beautiful this place would be during autumn. 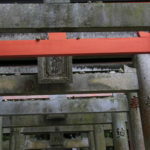 Due to lack of time, we did not enter every temple but we did sit there for a while, almost as if the place had its own gravity. I marveled at the irony that a non-religious girl like me who does not believe in idol worship can be so attracted to this place, only to realize that this is perhaps the true value of temples- where you can find your own peace, your own way. A quick lunch at a café where a pet dog greeted us was enough to keep us moving and we realized more than half the day is already gone! We realized that most temples happen to shut down around 5pm and thus we must hurry to enter at least one more. 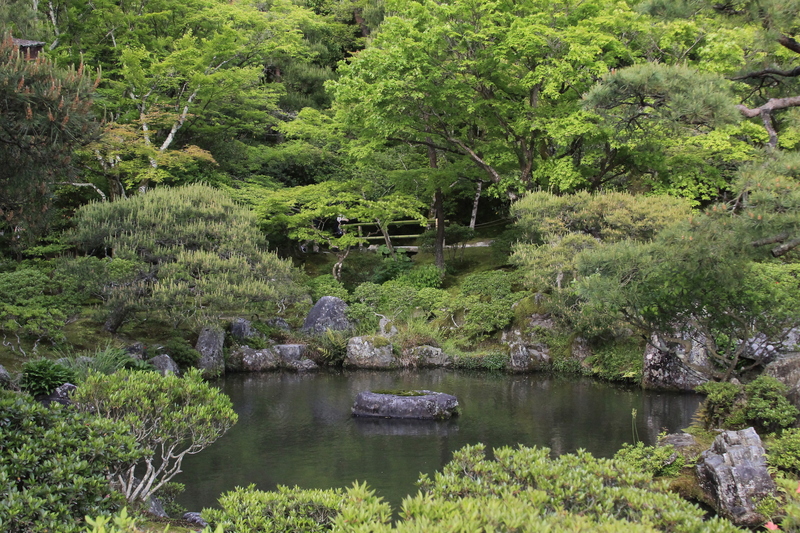 Our aim was to visit the Kinkaku-ji temple but due to time constraint, we decided on Ginkaku-ji instead. My friend told me it’s named after the silver symbol which lies on top of the temple. We explored the gardens and tried to capture in our memory as much as we could take in, before the temple shut down for the day. 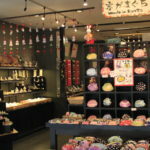 We walked the street ahead which was full of traditional Japanese items and I filled my bag with plenty of souvenirs. The elegant and colourful chopsticks with never-ending variety of designs are my favourite. It was evening and we could have easily gone for dinner since all the temples had closed down for the day but I wanted more, just a bit more of this wonderful city. Arashimaya was almost another end of the city. While the place is an attractive sight in the daylight, the roads barely have any lights at night. We sat by the river and swung our legs above the water as the mountains beside looked over us. We decided to go into the famous Bamboo Forest even though it was pretty late. The initial walk is through a forested area which would have been very normal during day time but at night was almost pitch-dark. There were occasional faint sounds of perhaps leaves or small animals but we ignored them and walked ahead. My friend confirmed with me again n again if I was sure I wish to go on. She was happy to see markings that point the way ahead as it showed we were not lost. 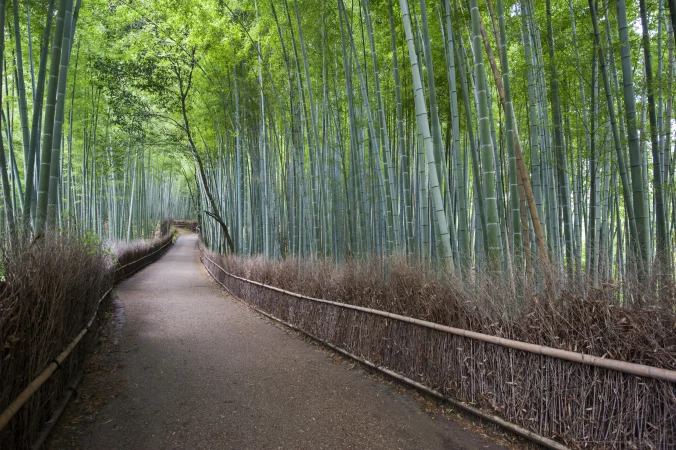 We followed google maps and reached the beginning of the path of the Bamboo Forest. Till then, I was sure about entering the forest. Till then, I had not seen other human beings nearby. Suddenly, right at the entrance, we spotted a car, parked on the side, silent and immobile. Meeting human beings at this stage was not exactly what I hoped for, even though I deeply respected the Japanese people. After debating a bit about our course of action, we flashed the light at the car while walking past it. A couple (perhaps middle aged) looked highly annoyed, they seemed to be praying! Till date, I have not deciphered their possible reason to sit in a car quietly in the middle of the forest and pray! My friend asked me if they are into black magic! I did not wish to entertain such thoughts at this point of time. We marched on, deeper into the path, surrounded by gigantic bamboo trees on both sides, guided by our flashlight. Not a single soul in sight and pin drop silence. Was I scared? A little, of course! Then, I looked at the trees, their shape, their number and forgot all about my fear. I urged my friend to switch off the lights for a minute to enjoy the darkness. Much against her will, she did. The next minute was possibly one of the best moments of the trip. Complete darkness at first. Then, your eyes get used to it, the shapes of the trees begin to appear eventually. As I stood there, amidst this dense bamboo forest, I realized yet again how small we are in front of Mother Nature. I took deep breaths and enjoyed every second of the silence, of the forest in darkness, the wind which reached us in between the gaps of the trees and the serenity of the place. My friend jolted me back to reality with the lights and we continued walking along the path. As we walked, we wondered where the path leads. We reached a small temple where some lampshades were hanging and they were lit! We also passed by small sub-temples (perhaps) which were closed. As we entered the area, we thought we saw a shadow of a man passing by. We looked around and there was no one. Not only did we remember Japan’s low crime rate, we also felt safe due the nearby lights. We walked on further and saw a man coming back. We realized later, he lives there. Finally, we reached the street and thus human civilisation was upon us once again. We walked to the Arashimaya station which itself is designed like a kimono forest and lights up wonderfully at night. We took the empty train back and realised we were starving. We found a small street full of restaurants, small eateries and some bars. While it seemed like midnight in Arashimaya, this place was full of life even at this hour. We walked up and down the street attempting to decide where to grab dinner, till we came across a tiny eatery with an open kitchen. I love these kind of places. The food looked fresh and authentic. The place was super crowded and everybody seemed to know each other as well as the cook. They ate and drank and chatted merrily sitting on small chairs right beside the road. Everyone seemed happy. We went in to ask for Takoyaki but the cook understood only Japanese and there was too much noise. A kind customer helped us convey the massage to him. Finally, it was decided that we would come back in an hour to pick up our Takoyaki. Just as we were about to leave, we saw him cooking some delicious fried noodles. We instantly wished to try it out but he informed us that it was for another customer and his stock is over. Feeling our disappointment, the same kind customer who also seemed to know everyone, gave us two bowls and chopsticks and picked up some of the noodles from his friend and told us to try some! We did and it was indeed delicious. He offered us some more after we were finished. I was speechless at the hospitality shown to strangers-foreigners. We thanked him wholeheartedly as he went back to chatting with his friends. Even though language was a problem, everyone seemed more than happy to help. Only in Japan! 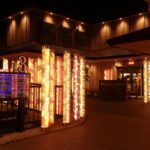 We walked on and found another restaurant with a lively ambience. There was a game going on where 2 winners would contest by playing some game and the winner would receive a free dish (one of their specialities). We were welcomed and shown the menu. We decided we must have sushi at least on my last day here. Hence, my friend ordered sushi. After a quick conversation with the waitress, she informed me that the translation seems to imply some animal’s meat but she could not remember which. We ordered it nonetheless. Later on, she remembered that it means horse, Horsemeat sushi! I was even more excited! 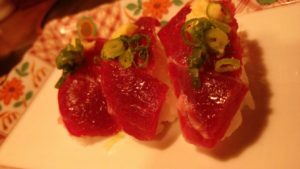 We had a fantastic dinner and horsemeat sushi did not disappoint, although the meat was a little chewy. We went back to collect our Takoyaki from this friendly bunch of people at the eatery and wished them goodnight and headed back for the night. Kyoto’s only problem is that the closest airport is the Osaka airport. This was going to be my first journey without my friend but I had gotten more accustomed to the public transport. I left early morning and hopped on the bus. The bus would drop me at another bus terminal from where we can find bus services to the airport. I made a guess between two stops and chose the correct one. Once I reached, I asked around to reach the place, only to realize you have to book tickets as the immediate one is already fully booked. I booked my tickets from the counter, fetched myself breakfast and waited for the next bus. An uneventful journey when I began to realize how hectic these last few days have been and how less time I have dedicated to sleep. I dozed off only to wake up at the correct moment to get off at the airport. The airport amidst all the water! With a heavy heart, I bid goodbye to this polite country which was a culturally a world apart from any place I have visited earlier. I realized I would not wish to live in Japan, except for Kyoto perhaps but there is definitely a lot I could learn from them. I promised myself to visit Kyoto during fall and the other stunning beauties this country offers and drifted to sleep as my flight took off for Singapore. 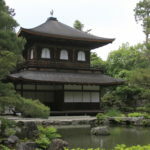 First and foremost, visit Kyoto. No other place in the world can substitute for its charm. 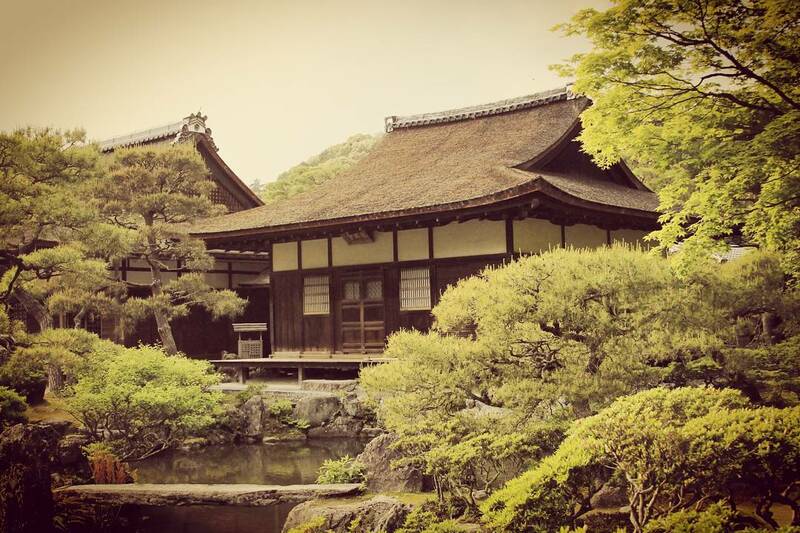 So, if you have one day in Japan, go to Kyoto and not anywhere else. Trust me, you won’t regret it. 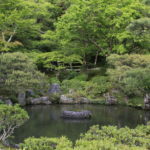 Best season to visit Kyoto- Fall, which is during November and/or early December. The leaves display various shades of orange & red and the whole city is transformed into a fairy tale world. Of course, cherry blossom is beautiful too. Best mode of transportation- while public transport is pretty good and some of the bus stops even offer free wifi, the best way is to cycle around. So, if you know how to cycle (which most people do know, unlike me), that is indeed the best option. Do note that visiting the temples often involve a lot of walking around even after opting for public transport. 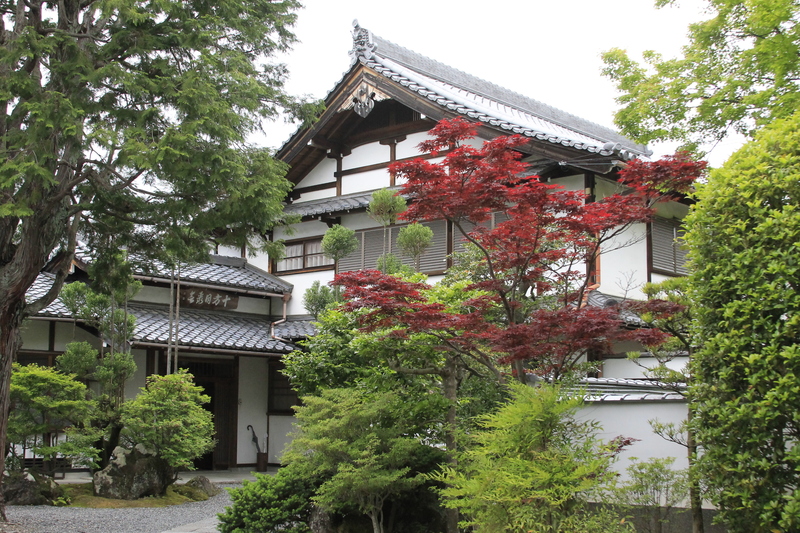 However, you won’t mind the walk in the beautiful streets of Kyoto. Time- most of the temples and shrines close early around 5-6pm. So start your day early to cover as many temples and shrines as possible. Leave the evenings for exploring food and drinks and Karaoke. The locals are friendly- remember unlike the smaller cities of Japan, some people actually understand a bit of English. Being Japanese, the people are very friendly and helpful. So, don’t hesitate to ask for help if you need. 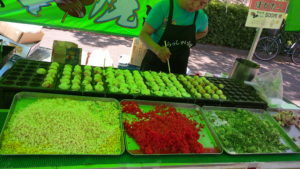 Try the Japanese food- Japanese food is famous all over the world and there is a reason behind it. It’s Oishī (delicious)! Thus, other than the fresh sushi, also try every other food you can find. Enjoy Karaoke- This is everywhere in Japan and if you are in Japan, this is a must. 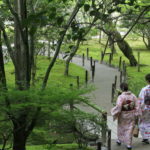 Enjoy the pace of the city- Kyoto is the land of people who enjoy peace and beauty. The streets display a natural charm and just strolling around or sitting in a small empty shrine can have a calming effect on your mind. Adapt to this pace to enjoy its true beauty. 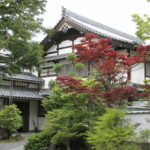 Last but not the least- over any city in mainland Japan, always, always and always choose Kyoto. 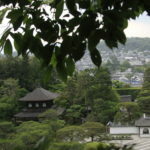 Trust me, you are going to regret it if you spend your mini vacation in Tokyo instead of Kyoto. Tokyo is cool but so are many cities in the world. 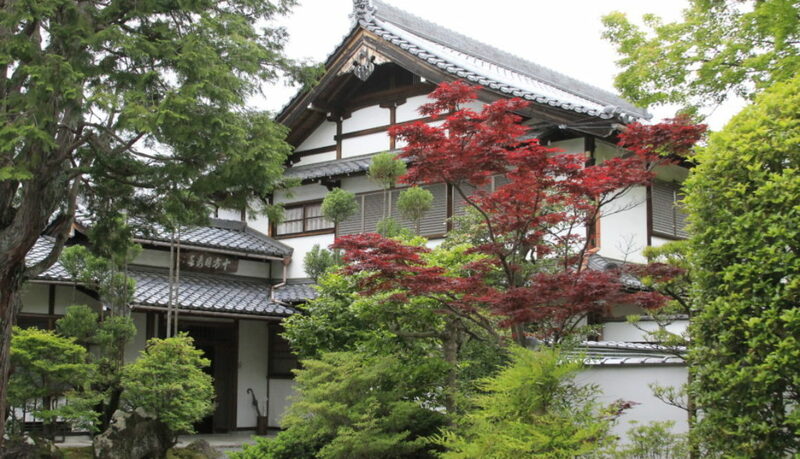 Kyoto has successfully blended its traditional beauties into the modern necessities of life. It is the perfect mix of the old and the new and this is why you can stay here not just for a weekend but forever. While the larger and touristy places have some English speaking population, the smaller cities have almost none. 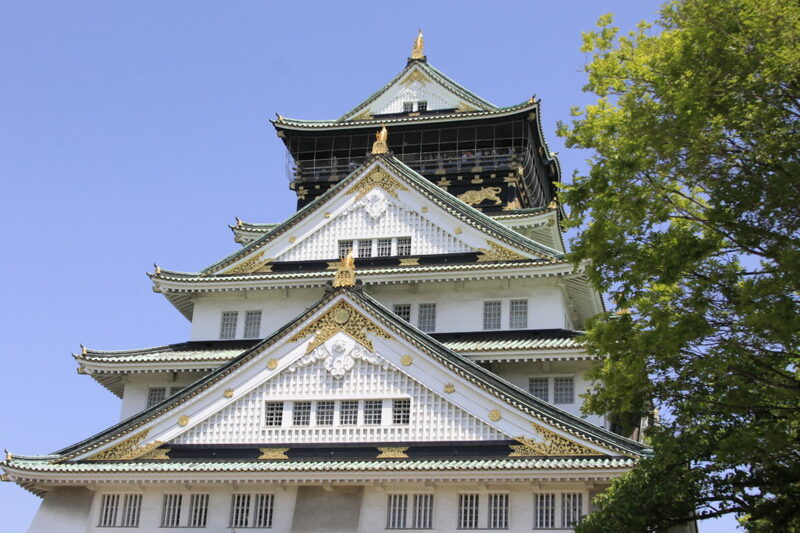 It is extremely useful to know someone who speaks Japanese if you are going to visit these cities. Japan is not a small country. It’s divided into multiple islands and each boasts different beauties. It is useful to chart out which one you would like to visit. Understand the railway system well- there are 4-5 types of trains. Mostly, they distinguish themselves based on speed and thus not all the trains stop at all the stations. There is local, semi- express, express and of course the Shinkansen. Do attempt to visit during autumn or cherry blossom or some festival. 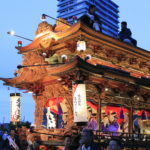 The Golden week (Hamamatsu Matsuri) is a good time to visit Hamamatsu, fall is the perfect time for Kyoto, summer is perfect for climbing Mt. Fuji and winter perfect to experience its snow from a distance. Try the snacks- Japan is a country with endless variety of snacks. Many of these are absolutely delicious. The train stations often have many shops. Remember each city offers different types of snacks. Thus, don’t wait for the last city to buy them. Keep experimenting and buying them as you travel from one city to another. 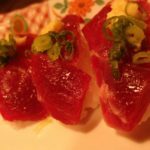 Learn to use Chopsticks- so for many this might sound trivial but in most of the cities chopsticks are all that is available during a meal. Forget your forks, spoons and knives and be prepared to use these sticks. Respect the culture- the Japanese are very well mannered, polite and humble. Kindly return the favour. Don’t insult their customs or traditions and try to reflect kindness and helpfulness in your behaviour. Click on the pictures below and follow my journey visually! Don’t forget to follow me on instagram (madhurimadutta12) for more pictures! Hello, I am Madhurima. Bit by the travel bug, I began to explore the unique experiences this world has to offer us. This blog will not only describe my journeys but also talk about unexplored places of each of my destinations. Learn more about me here..
Get the Free Ebook on "How to immerse yourself in a country's culture while travelling"